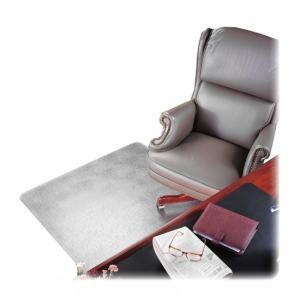 Deflect-o CM17743 Beveled Edge Chair Mat - 60" Length x 60"
Protect your special rugs, carpet and flooring from damage caused by chair wheels. Ideal for plush, high pile or heavily padded carpets over 3/4" thick. Vinyl, classic mat offers maximum transparency and durability. Blunt end studs won't pierce or damage your carpet backing. Beveled edge allows smooth on-and-off chair movement. Textured top surface is slip-resistant and scuff-resistant. Chairmat is almost 1/3" thick to help prevent sinking.